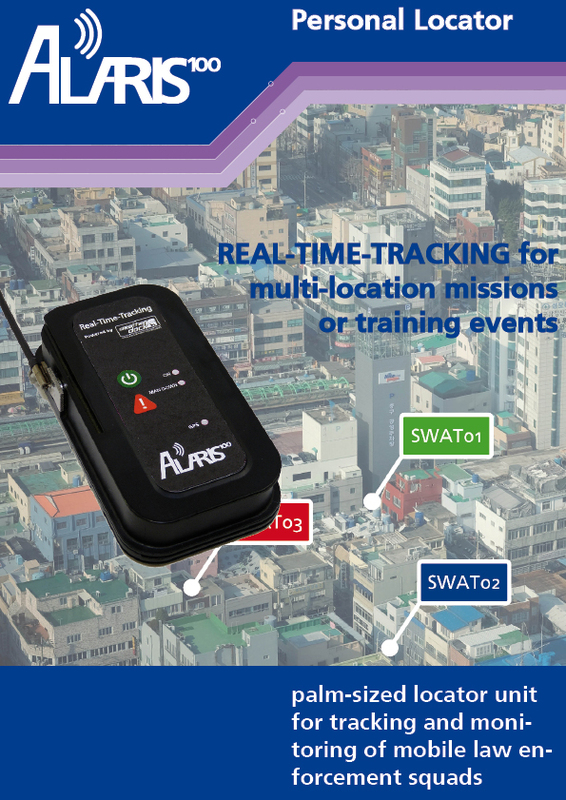 ALARIS100 is a palm-sized portable locatr beacon designed for law enforcement and mobile squads. The unit is based on VHF technologies and gives LIVE-GPS-Position-Report of every team-member on customized and encrypted frequencies. Due to its size and rigid housing the ALARIS100 can be worn with a pocket on the balistical vest easyily during a mission. The ALARIS100 is completely independent of any GSM network infrastructure, so there will be no problem if mobile communication systems are shut down for safety reasons or just overloaded by massive activity in social media networks by the people. With its very longlasting battery power the ALARIS100 is a reliable partner during long-time multi-location-events. Within the shortest transmission mode battery lifetime wil be approx. 20 hours before there is a need for recharging. The additional „man down“ panic button triggers a special marked position report on the screen. Think about possible scenarios when GSM mobile networks are shut down for safety reasons or the network is totally overloaded caused by too much social media activities in the vicinity. 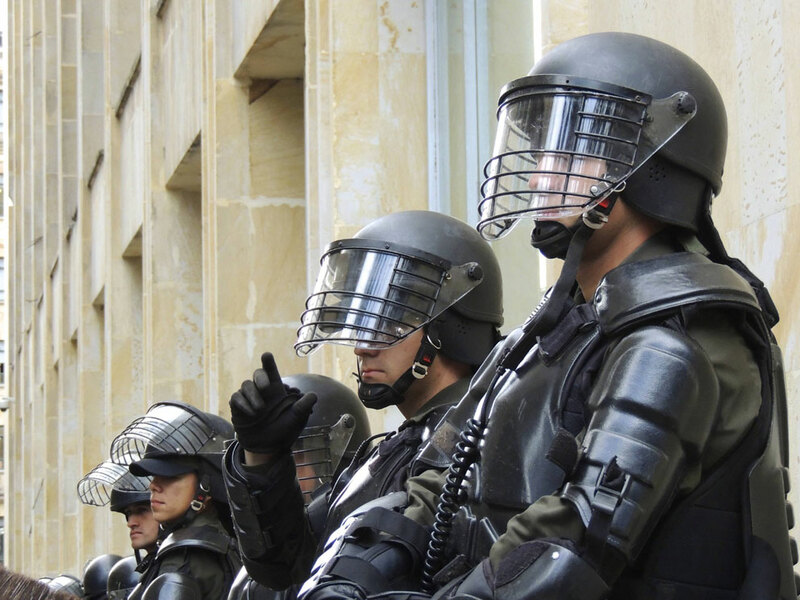 Uniformed and special mobile forces need to know where are the team-members to identify „friend or foe“. The ALARIS100 is a 100% independent sollution based on VHF peer-to-peer transmission. A receiving station, tuned to the same VHF frequencies is able to receive and to display the given position reports on a screen to monitor and to coordinate forces e.g. in multi-location-events. Customized VHF frequencies with an additional 128Bit encryption. Just imagin how easy automatic secure GPS position reporting can be done with full radio silence. Due to the automatic reporting functionality team-members can stay concetrate on the mission. Mounted in a small pocket on the balistic vest there will be no inhitation of movement by means of the palm size of the ALARIS100. The ALARIS100 comes along with a very longlasting battery pack. Within the shortest trasnmission intervall of every 2 seconds, the battery lifetime before recharging is about 20 hours. As longer the intervall – as longer the battery lifetime will be. This points out another big part of independence, even in multi-location scenarios where it is impossible to change battery pack every 2 hours or to built up permanent power supply infrstructure. A „man down“ panic button is also included into the ALARIS100 locator unit. Single-handed activation of a special marked alerting report on the mission control screen can be done easily.